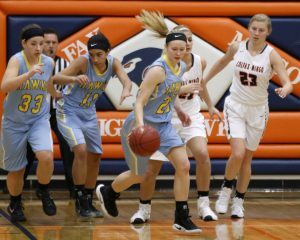 The Hawk girls started off fast and led the rest of the way for a 62-29 victory at Colfax-Mingo on Tuesday, Dec. 13. “We came out of the first quarter on the top of our game. We forced several turnovers and didn't give Colfax-Mingo any good looks,” said L-S Coach Jerry Hulsing. 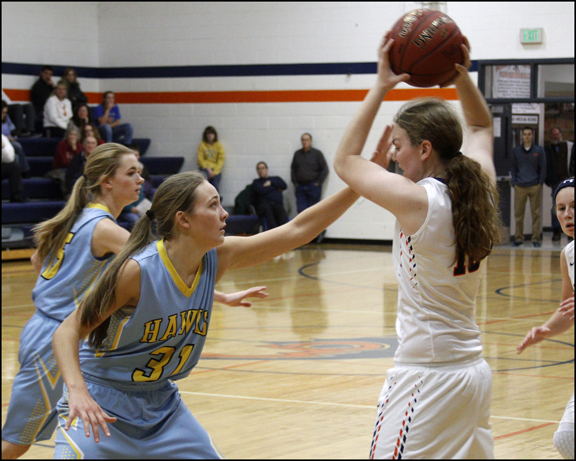 The leading scorer for the Hawks was senior Brenna Lanser with 17 points on 10 shots. Sophomore Carson Fisk shot 6-13 for 16 points. Junior Jataya Myer had nine points on six shots. Sophomore Carson Fisk takes the ball up the floor after grabbing the rebound. The Hawks relied on the fast break in their 62-29 win over Colfax-Mingo on Tuesday, December 13. “We knew that we needed to get to the free throw line, so we attacked the rim. We also relied on good defense to start our offense,” said Lanser. Junior Mariah Vos was the leading rebounder for the Hawks with seven rebounds and two on the offensive side. Fisk also grabbed two offensive boards for a total of six. Senior Jelissa Rozendaal also had a total of six rebounds with one coming on the offensive glass. “We didn’t do a good enough job of getting a body into them on the defensive side. They were able to scrap a couple of offensive rebounds and get some extra shots,” said Fisk. Lanser led the team in assists with five. Rozendaal had the next highest total with three. Junior Hailey Scandridge and Vos both dished out two assists. The Hawks (6-0) will host East Marshall on Thursday, Dec. 22, after hosting Belle Plaine Tuesday, Dec. 20.